In a previous post I talked a bit about the concept of Three Thirtyitis. After that, you should understand what I then mean when I'm suffering from 10am-itis. So this morning I woke-up a lot earlier than usual (1 whole hour! *gasp*) so I could meet-up with friends for breakfast before work, and on a Monday morning too! The attraction of such an early-week early-morning get-together was to see people we don't often see. Well, that was the premise from the point-of-view of the organizer. For me, I'd been lucky enough to actually see the others rather recently. Despite that, I made it through the cold, the rain, and the soul-crushing darkness that is the overcast cloud cover which has blocked sunlight from the city for several days now. I and one of the other train-riding guys caught the same train and made it in early. The next to come along lives a couple of suburbs away. The last person was actually the one who lives in the city and is the closest to the breakfast venue... typical. It was good though: breakfast was alright, company as always was great, lots of lols were had. But wow, I feel so drowsy right now: my eyelids are being drawn to the ground by more than just gravity and my concentration is so far detached from my mind that it's almost like having an out-of-body-experience. I would normally eat something sugary to keep my consciousness afloat, but this doesn't feel like a blood-sugar thing. If this were after lunch, maybe I'd try sneak-in a power nap, but that's not gonna look so good having just gotten into work. So instead I've settled for playing tracks from this seasons American Idol contestants a bit louder than usual through my headphones. Surprisingly the volume therapy is working wonders. The only downside was when a phone call came through and I picked up and put the receiver to my ear while my headphones were still on. Unfortunately for me, I'm one of those people that needs about 8 hours of sleep a night to function at 100%. I'm not somebody who can either operate on less sleep or supplement rest with coffee or a wide variety of energy drinks. I came across several of the latter kind at university, or at least discovered that a lot of my friends could also fit into that category. 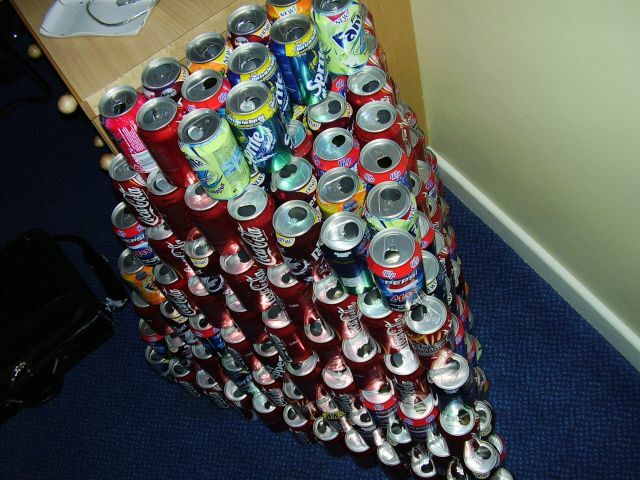 One of the guys always kept a 6-pack of V energy drink at their workstation and ended-up collecting them to create a massive tower. Wandering around my floor at work, I see one of the older guys doing the same thing with his takeaway cofee cups.